It’s no secret that I’m a big fan of BareMinerals, infact not a day goes by without a quick dust of their original foundation either as a “topper” to my liquid foundation – or during the Summer months – worn alone. I love their little store in Covent Garden that I like to refer to as a “swatchers paradise” with some of the friendliest MUAs in the area. If I’m honest, I find most of their ad campaigns a little twee (this one included) but they always make me take notice, and that means they’re doing their job right? I thought I’d share their latest campaign with you — half of you will be dry heaving at the saccharine-sweet concept, the rest of you will be joining me by doing the same but with a certain degree of admiration! Animal activists? Non-profit business types? Voracious readers? Striving to be like your own children? One half of me is completely inspired, the other half wants to throw my Full Flawless Face brush at the screen. I can’t help it, I’m such a *girl*, I felt a bit goosebumpy at the end, maybe someone left the window open? Yes, that must be it. 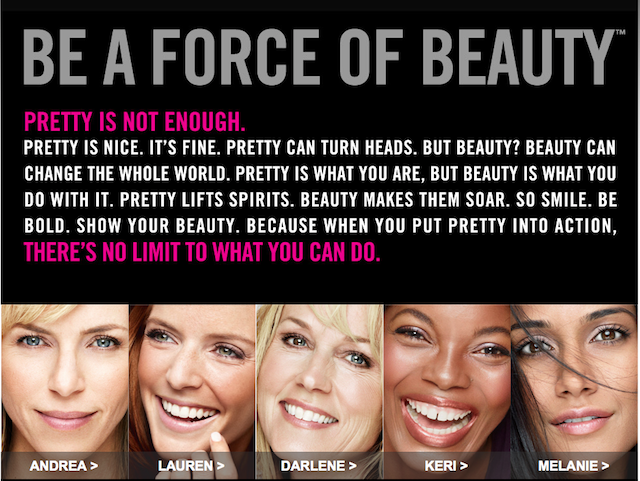 To read more about the campaign and the models selected to front it, check out the Bare Escentuals website. What do you think: cute, nausea-inducing or a healthy bit of both?! I just love the idea they had! If more companies in the beauty and fashion industry acted like this there would be better role models and women around the world would be much happier, I think! I think it’s a really great concept, but I do question their method a little bit. The survey was only sent to models and actresses, women who are in careers which, in general, expects them to conform to a higher standard of beauty than the average woman. So, they knew going in that every woman they were considering was conventionally beautiful. I just don’t think they were taking as much of a “risk” as they imply that they were. That said, I think the idea of interviewing them blindly is a great one, and I would love to see a company do this, but with completely open submissions. That would be an incredible move! Aside from the fact they looked for beauty in a field where they were guaranteed to find women who aren’t displeasing to the eye, I was totally sucked in. Call me a romantic (or a gullible fool) but I like to think beauty inside shines out. I completely agree with Emily and Lily. Call me a cynic but this seems like a gimmicky attention grabbing idea. They only sent the form to models and actresses?They were guaranteed to end up with 5 beautiful women at the end of it. Why not loyal BareMinerals customers? Who use and love the products. Firstly, I think the idea is brilliant and very true. Beauty isn’t a face or a body, it really does come from within. The problem with most of us is we’re programmed to judge people within seconds of meeting them, but that’s another subject. It’s very clever because it can be promoted across all channels and disciplines and will really appeal to most women who may not be ‘the ideal’. The thing to remember is that they’re American – ‘be like my children’!! ?, animal activist!!?? – what about the real things in life like being kind to people, being generous with their time. The soundbite still rules. Weight loss: If we want it as much as we think we do, shouldn't it be easy?